SENECA is a 1977 Pearson 28-1 sailboat. I am working on adding more info about her and the changes I made to bring her from the wonderful weekend cruiser she was to the live aboard sailboat and home for me and Leah, my First Dog. Go Joe–you have a chance to do something here for the P28-1 that no one has done before that I’m aware of. Glad to see you are living the life everybody dreams of. I always knew you would. This website will provide some vicarious living for me. Thanks. I got this website from Shawn who I discovered on Facebook. Glad to see you are embracing the sea. I finally got certified to scuba dive 3 years ago. Come to NY and meet my wife. I miss you broheem. Glad you are alive and well. I’m glad you made the trip in your Pearson. It is an underrated older gem of a sailboat. Fair winds and cold beers Joe! This is the story about a guy and his dog.... Five and a half years ago I did not know how to sail and had only been aboard a couple of times. Following some friends, I took a week long sailing course in Florida. I was hooked. Six months later I bought my boat, SENECA, a 1977 Pearson 28, and started working toward cruising. For the next 16 months every weekend I could I drove 3 hours to the Chesapeake to my boat and sailed or worked on her. During the week I worked two jobs and I read, saved and researched. On November 11th 2006 I put the last of my stuff on board and then my dog Leah jumped on and we left down the ICW. Six months and a couple thousand miles later we ran out of money and got a little homesick. Seneca stayed in Puerto Rico and Leah and I came home for the summer to family, friends, and work. My second season again started on Nov 11th in Salinas, PR. Knowing that I would have to work that winter I sadly left Leah in the care of my Mom. After a few days of scraping Seneca's Bottom, getting the engine running, and provisioning, I set off for my next goal of the Virgin Islands. I pulled in to Coral Bay on St John on Thanksgiving morning to a huge pot luck dinner at Skinny Legs. I spent the next few months based out of Coral Bay, working and sailing around the BVIs, and was able to get a bunch of friends to come down and visit. I returned to the States again in May and now I ready myself to go back down and see what this year will bring. 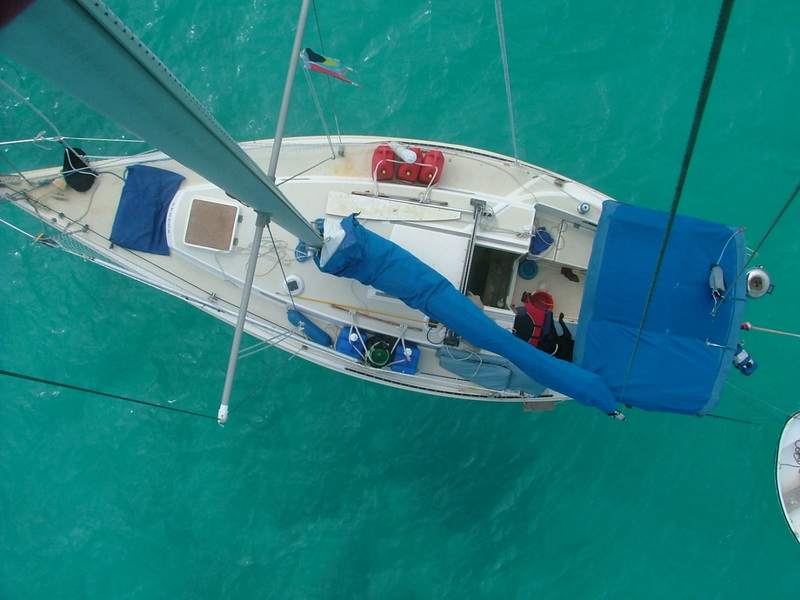 I spent one more winter in the Virgin islands and then sailed SENECA back up to the States. She spent a year Aon the hard in SC while I made some money in Va. Sadly Leah, the dog that made that first year so great passed away. After more than a year I was finally ready to get another dog, so Marley, my new white boxer will be joining me on tha baot now. Seneca is back in the water after working on her for a couple months and I am ready for a short trip to Florida.